Back from WOW and China!! I’m finally back in Kuala Lumpur after 14 days spent in China! I spent the whole day sleeping on day 15 and back to office on day 16! Although there is no time difference between China and Malaysia, I still feel “jetlagged” and tired and trying to catch up with some sleep and rest! I came back tanned! I can’t find my tube of sunblock when I was packing and decided to forget it. On the first few days of tour, I don a scarf wrapped around my arms and body, wore a hat (thanks Tracy!) and carried an umbrella. But it was too much feat to be holding so many things (plus water bottle/bag) and snapping photos at the same time! So during the final few days, I just wore a hat and kept the scarf (being vain la, wanna look nice in pictures) so that’s how I got my tan! Some people also commented that I lost some weight. 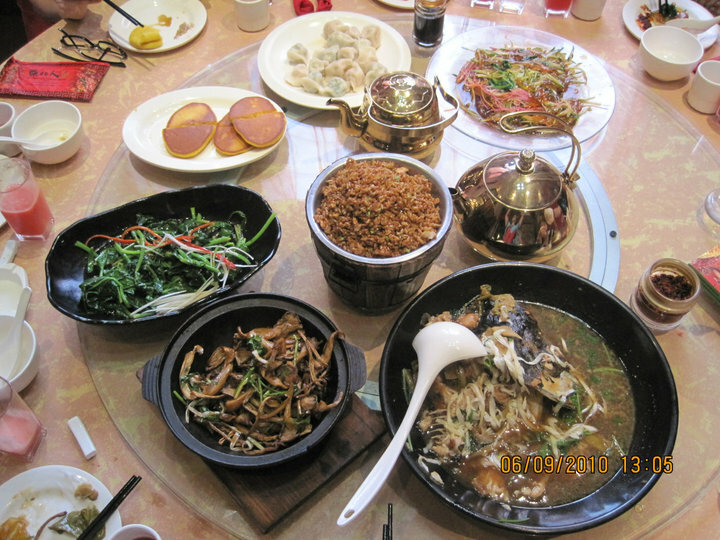 Not that there are not enough food in China, but the food was too much in too big portions! Most of the food tasted good but very oily and salty. Yes, I do miss Malaysian food so much! Thinking about Nasi Lemak, Banana Leaf Rice and Bak Kut Teh! Anyway, must be my tan that gave them the visual that I lost some weight… LOL….!!! 2 Sept: Half of us slept past our alarm clocks and had to rush to the airport in the wee hours of the morning. Thank goodness Maggie, our transport manager, has checked us in online a day earlier, so we just need to check in our luggages. 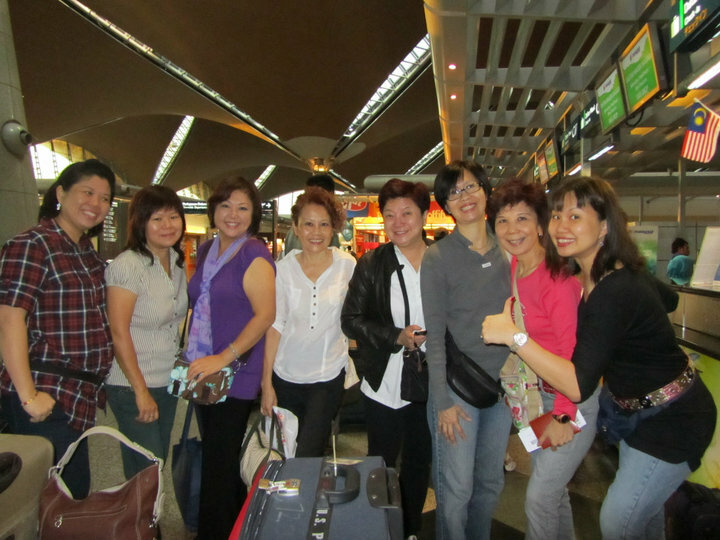 At KLIA, everyone gathered and looked very excited, and comparing the luggage size of one another! MH flight took off at 9am on schedule. We arrived at Shanghai Pudong Airport at about 1pm and by the time we checked out at the immigration and collect our baggage, it’s about 2pm. Arrived and checked in Asset Hotel at about 3+pm. Rested and unpacked abit and we head out for a slow walk to Sports Hotel where the Registration and Open Dancing is scheduled to take place at 7pm. The distance is about 1.5 km and we peek into every shop checking Shanghai out (actually just Nandan Road). We finally reached Sports Hotel just about 6pm but since the Open Dance was scheduled at 7pm, we decided to check DINNER out first at a nearby stall. We found out food portions in Shanghai is Extra Large, 7 of us couldn’t finish 4 plates of rice. Then we go to Sports Hotel to find out that the Open Dance has started b4 6pm cos everyone was just too excited! Haiyaaaa!!! I even missed the photography session with all the instructors! *sulk* Open dancing was a lot of fun but I missed many dances (eg Patrizio’s Rumba!!!!) cos I was busy meeting the line dance community from all over the world! We had only communicated via emails or Facebook and now finally saw them in “3D” LOL. So much to catch up and take pictures. Most importantly, I met Robert Mah, and he had brought along Carmen’s plaque for everyone to sign. Such a darling he is! At midnight, the ball is over and everyone ran home lest they turn into rags… we decided to take the cabs back as it’s too dark to walk (1st excuse), our feet were tired from all those dancing (2nd excuse)… and also, to keep the energy for the next 2 weeks (3rd excuse)! 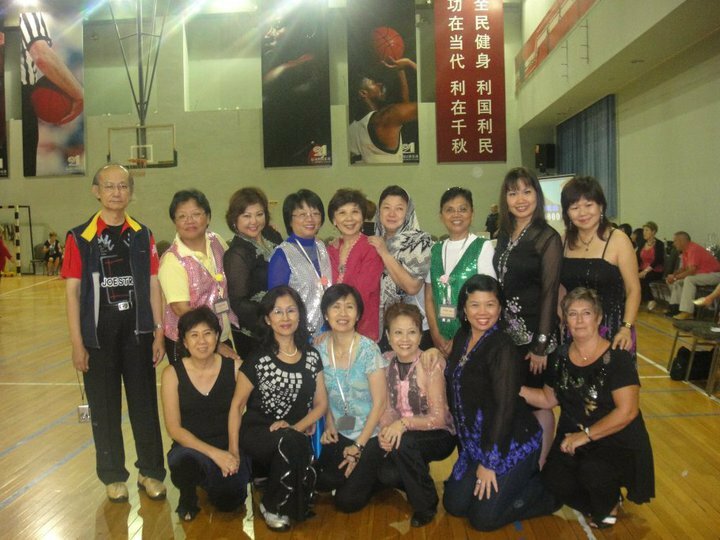 WOW workshops officially started at the S&J Sports Club (East Tianlin Road). There were about 200 WOW participants! Rosie Multari’s event was first – a zumba workout for warming up. 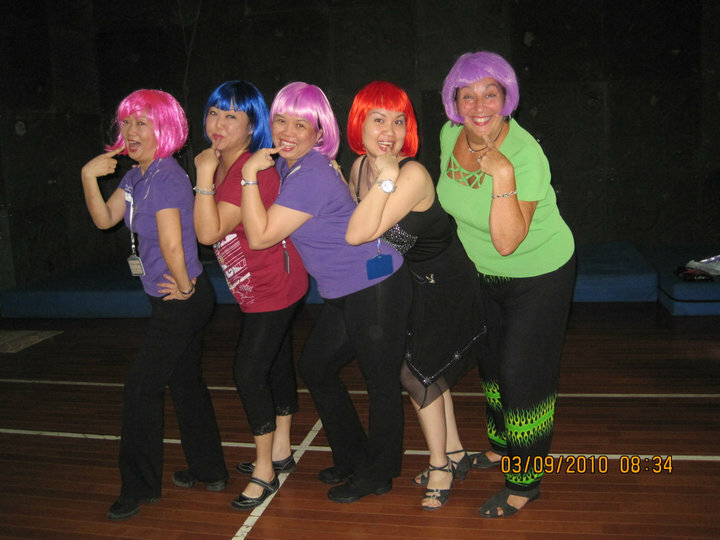 We had planned to wear colourful wigs for this session, so Wendee, Janice, Mei Ling, Rosie and I donned our colourful bob wigs… to everyone’s delight! The room where we had this session was a HOT badminton room and oh boy, we were real HOT (literally and figuratively). My teaching slot was the first and I was scheduled to teach Cuban Yeah and At This Moment. We also did a quick warm up dance of Looky Looky! Thereafter, I attended classes by Jo Thompson (Fortune Foxtrot, True Love, Zenyatta’s Waltz, Doggone Blues), Marilyn McNeal (Cry Me Out) & Kate Sala (Drip Droppin). I love Jo’s teaching so much! She’s such a pro. So much to learn from her, not just steps but how to be a good and effective instructor! After all the workshops, we rushed to the Lim Sisters’ room at Sports Hotel to change and freshen up for the night activity – Dinner and Chinese Circus show. Great circus show and my favourite was the romantic couple flying around the ring using scarves. Soo Wong did a re-enactment of the stunts with the bus curtains – LOL! 4 Sept: 2nd day of workshop. I was scheduled to teach on the 3rd slot, so on other slots, I attended classes by the Kinsers (Look at You & Haunted), Lina Choi (In Love) then jumped to Niels’ (With These Eyes), Jo Thompson (Technique), Rachael (Stupid in Love) and Kate (Don’t Kill the DJ). I taught Shaken Not Stirred (Paul McAdam) and my own Let Me Dance. Let Me Dance attracts the attention of many dancers and they loved it, esp the part where they felt “hot”… for 2 weeks after that, many dancers posed that way when they saw me :-D. Again after the workshop, we rushed to the Lim’s room to change and freshen up. 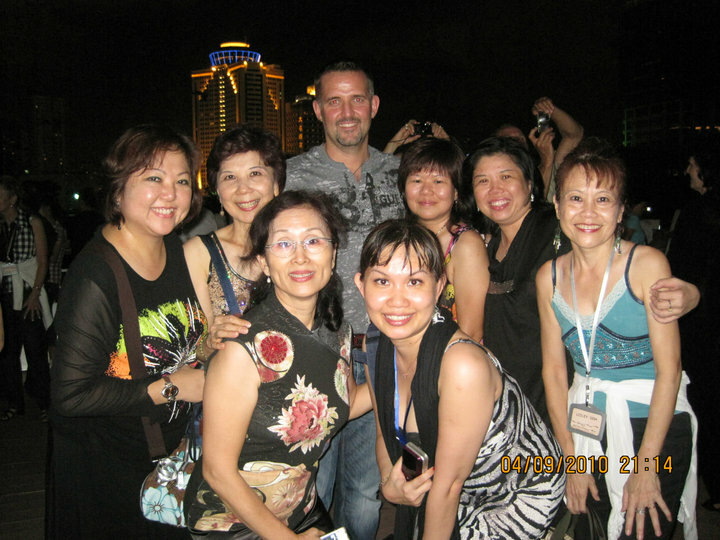 The night events are dinner and cruise by the Bund. Enjoyed the Shanghai night scene and landscape very much! So colourful and vibrant! 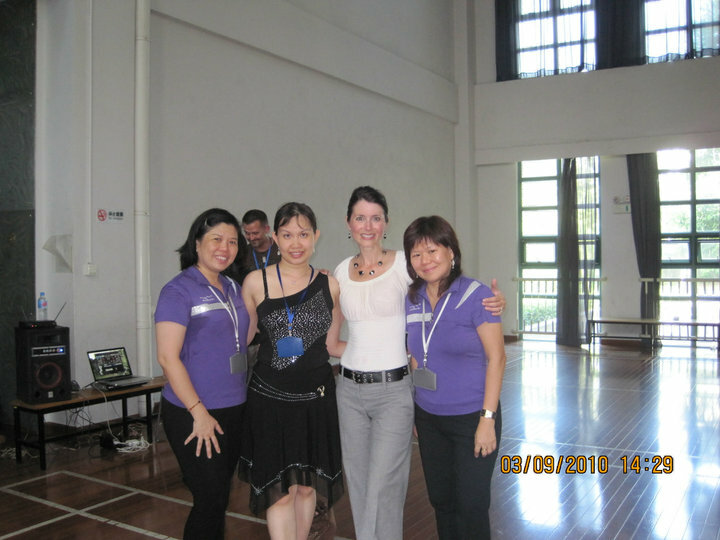 5 Sept: How time flies, last day of WOW Workshop! Again I’m scheduled on the 3 slot. 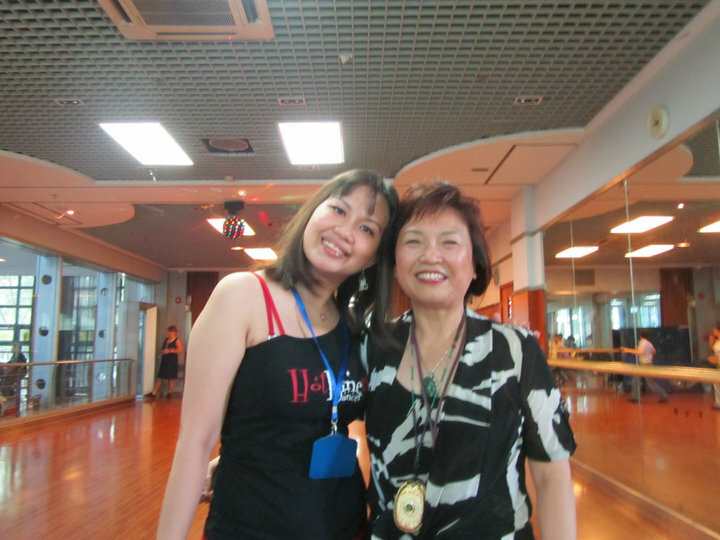 This time I taught Innuendo, a dance specially requested by Judy Chen, the event organiser. This time, my class was fully packed and everyone loved the song and the dance very much. Ursula from Switzerland took a video snippet of the dance. I’m so glad I brought a Malaysian song/dance to the international arena. On this day, I attended the classes of Rachel (Cyclone) and Rosie Multari (Jersey Girls Cha & Amore Mio). Skipped the other classes but sat down and watched them dance cause I was relieved that my slots are all over, and yet so physically and mentally tired. Decided to just mingle with other dancers. Night events: We donned our National Costumes the Kebaya for dinner at Sports Hotel and thereafter Open Dancing & Karaoke. But no one sang cos we’re all line dancers and prefer to dance! Everyone was happy and mingled around as most of us have got to know each other better during the 3 days. People exchanged gifts and signed autographs. 6 Sept: Woke up with a sore throat. Must have got the virus from other dancers during the hugging. We have 2 free days in Shanghai b4 the tour. We decided to visit the local dance apparels shop. Heard the shoes are dirt cheap. Arrived there at 10.30am and true enough, we were choosing and buying shoes like they cost nothing. Everyone of us bought multiple pairs of dance shoes. I think I bought 7-8 pairs! Gulp… Also bought a dance top and a dance skirt. Hope to wear them at parties soon! After making the shop boss rich, we left his shop and came to a Manchurian Restaurant. Very lovely deco and food. We thought the price would come up to a hundred per pax but were pleasantly surprised with the cheap and reasonable price. Saw some really big bones eaten like drumstick… I call the bone – Dinosaur Bone! We then decided to go to the Shanghai Qipu Road to shop for “wholesale priced” stuffs. Time was too short and we managed to buy some blink blink tees and belt. Everyone’s still tired and decided to head back to the hotel. At night, after dinner, 3 of us got a hairwash at a nearby salon. Our hair felt so much lighter after that! 7 Sept: We split into 2 groups cos we have different objectives. 1st group visited the Shanghai Financial Tower and 2nd group (with me) decided to continue shopping at Qipu Road. Wendee has then started “diarrhea” and I have sore throat and we decided to have some porridge. 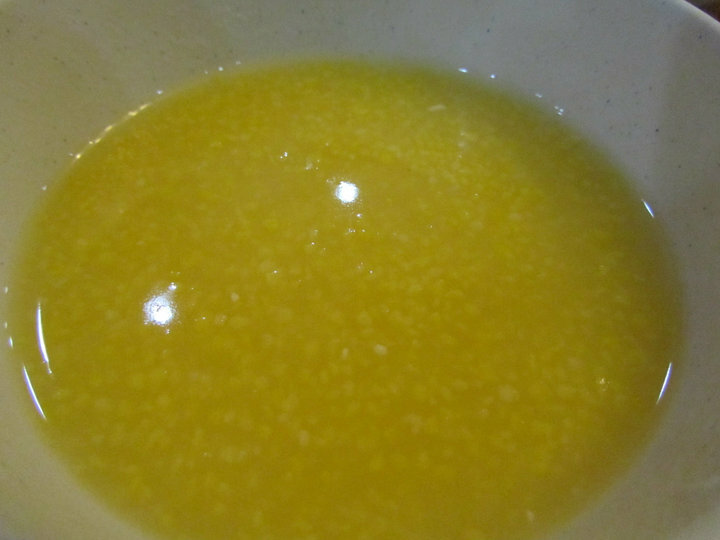 The porridge wasn’t made with rice but with some yellow grains, which we suspected might be lentils. Then shop till evening at Qipu Road, and bought lots and lots of stuffs (which I dun even remember what!). Night: Farewell dinner (Duck Meal). 9 Sept: After a restful sleep, we depart from Suzhou Hotel for Hangzhou. Can’t wait to see the infamous West Lake! The bus journey took about 2 hours. We head straight to the Xixi wetlands for a boat ride in the marsh. Had lunch in the wetlands. Thereafter, the guides brought us to a temple which a few of us did not go in. It was just too hot and too long a walk, we decided to take refuge in an air-conditioned post office while waiting for the others! Went back to hotel for a rest, and at night watched the West Lake Impression show directed by Zhang Yimou, who also directed the opening ceremony of the Beijing Olympics. 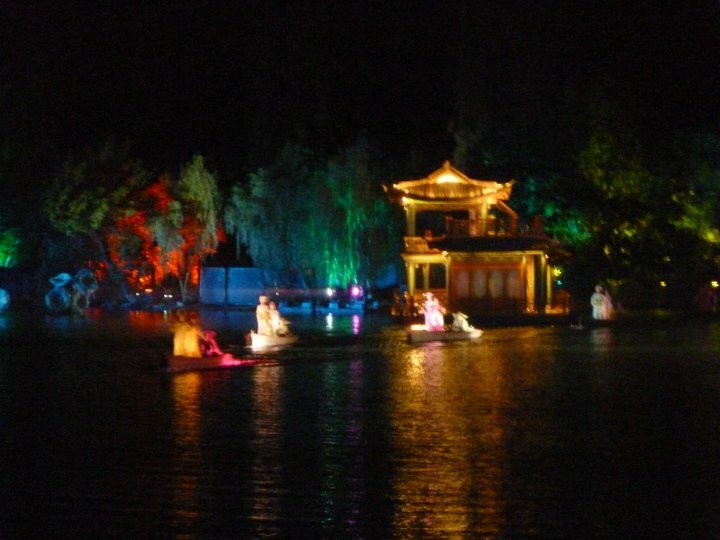 The show portrays actors/actresses walking on water (lake), with beautiful lights and music. It was a great show with much effects, although I don’t really understand the story! We then went back to the hotel and guess what is missing? We didn’t get to see the beautiful West Lake and the famed bridges… 🙁 utterly disappointed. 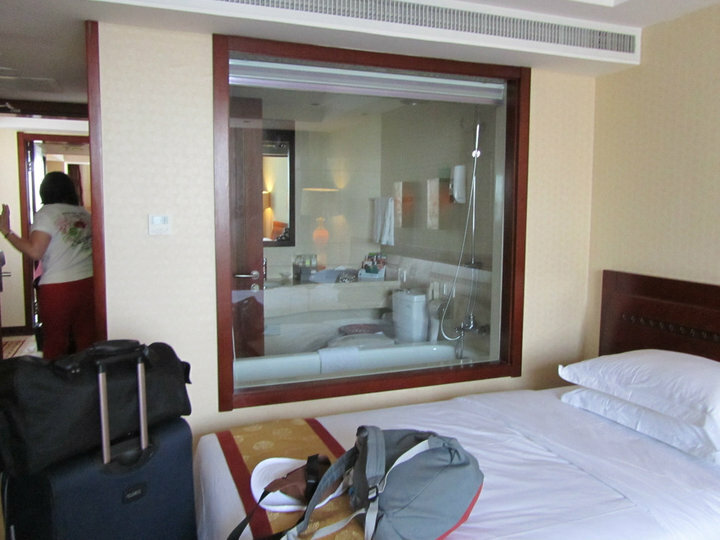 We checked in the hotel at Xi’An and pleasantly surprised to see the glass walled bathroom… haha… luckily there’s a curtain or else we need to chase our room-mates out of the room while we take our luxurious baths! Next we visited the Ming Wall, which the tour guide told us, was 13.5 km long. 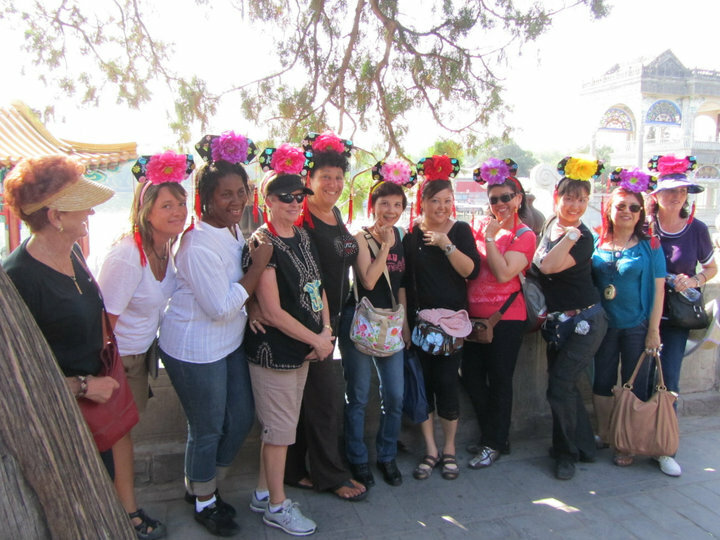 The sight was amazing and made us anticipate the visit to the Great Wall. At night, we were treated to a Ming Show – a cultural dance & music show. I enjoyed it very much! 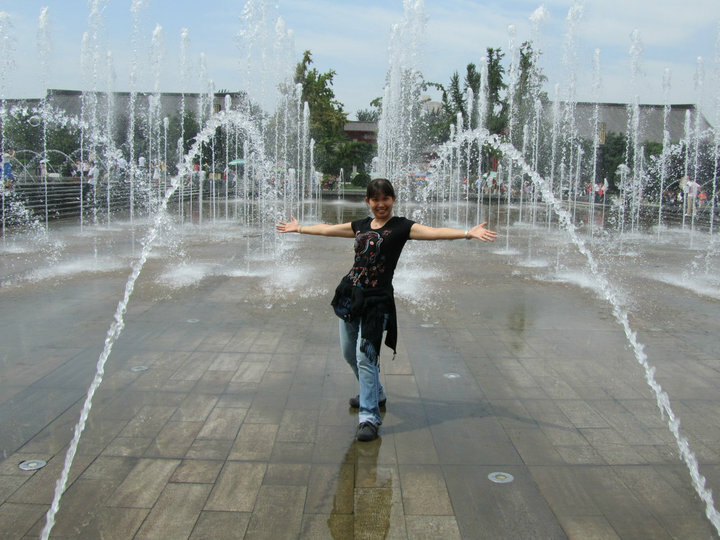 So far, I liked Xi’An the best! (can see how long I wrote!) For dinner, we were treated at a dumplings restaurants that serves all the different types of dumplings you can ever imagined! 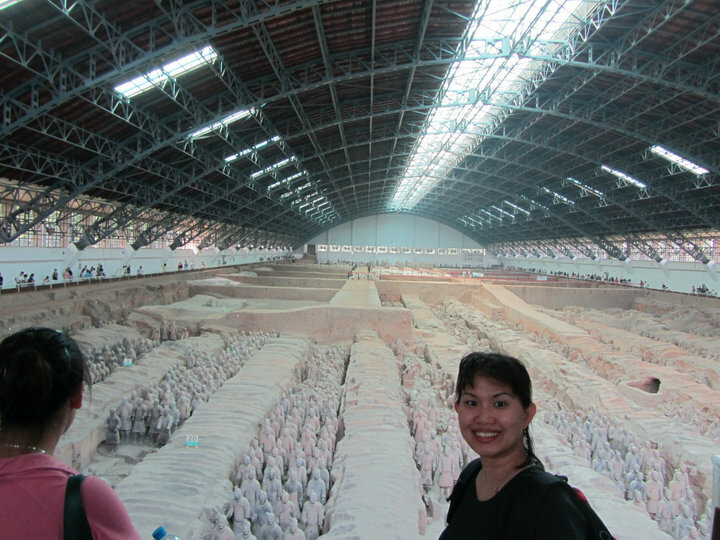 When we arrived at the museum, I got to know that the museum is the actual excavation site! My heart soared again and was overwhelmed by the sights of the warriors. Huaqing Hotsprings where the famed Imperial Consort Yang Guifei bathes and retains her beauty. The Hotsprings here wasn’t that apparent but scenery was extremely beautiful. 12 Sept: Beijing day 1: Woke up in Beijing. It’s less cooling compared to Xi’An but definitely cooler than Shanghai. Head out to visit the Beihai lake and experienced the bicycle trishaw ride. At the Beihai lake, a group of Chinese were practising their folk dancing when we just lined up and started dancing to Come Dance With Me and Hello Dolly (to the Chinese folk song). I think we missed dancing too much! Many passer-bys stopped and watched us, some even videotaped us. I’m sure they were curious seeing foreigners dancing in their park to their tune! 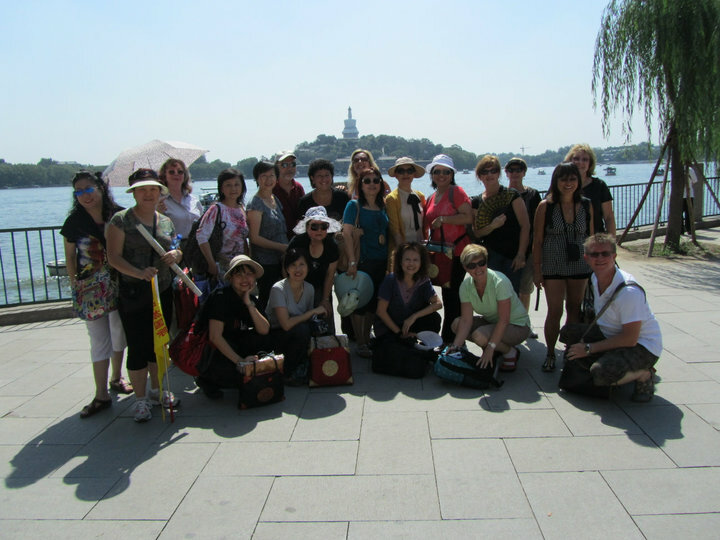 Next we went to the famed Summer Palace. 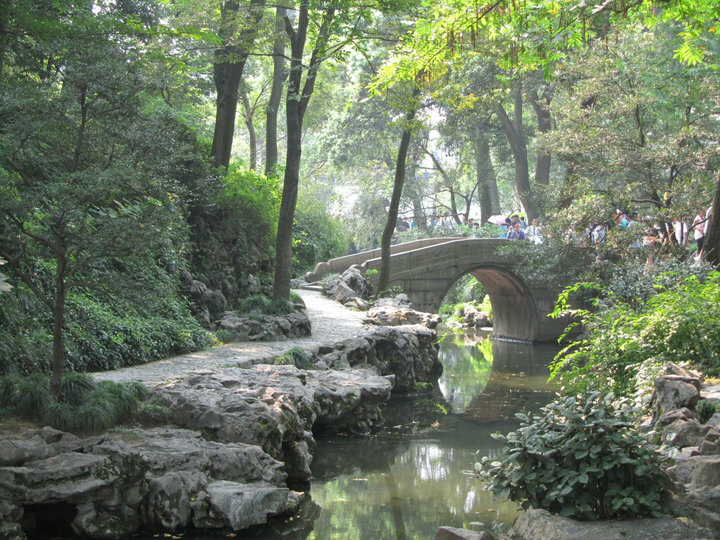 The landscape and architecture of the Summer Palace is so beautiful, with a view of the lake. Most of us ladies bought a concubine headgear hairband and took pictures wearing it! We felt so imperial! LOL! After the Summer Palace, we were brought to the Olympics Stadium and saw the Birdnest and Watercube stadium, from afar, not within. For dinner, we were treated with the famous yummy Peking Duck! At night, we ran through the steps of Come Dance With Me, Have Fun Go Mad, and Jesse James, in preparation to dance these at the Great Wall the next day! 13 Sept: Beijing day 2: We woke up feeling excited. 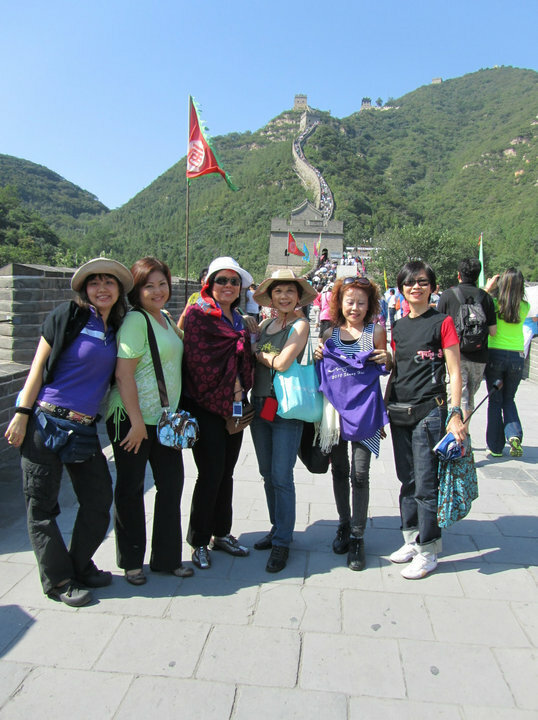 We will be visiting climax of the trip – The Great Wall of China. This is one trip, that got the full attendance. In the bus, the tourguide announced that we would not be visiting the Badaling Pass (most famous one!) as the road there is congested and would take a longer time! Hmmmph! 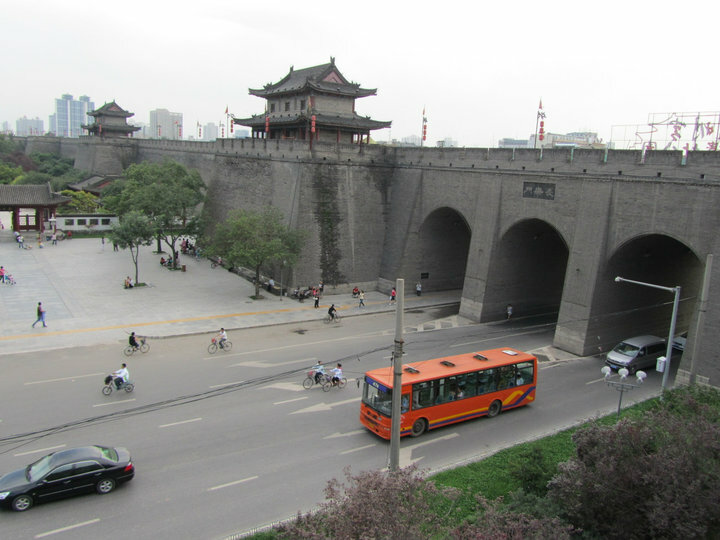 We would instead visit the Juyongguan Pass which he said is the beginning of the Wall.. hmm? Anyway, the bus ride took about 1.5 hrs and everyone was awed by the sight of the Great Wall. We quickly gathered at a wide and flat area on the Great Wall. DJ Louie plugged in his mini speakers into the Ipod and played the 3 songs for us to dance. We danced about 2-3 walls of each dance: Come Dance With Me, Have Fun Go Mad and Jesse James. As usual, people stopped by to watch us. We had the dance video-ed too. 🙂 Very symbolic. Then everyone went on their way to ascend/descend the Great Wall. The ascend route was very crowded! And steep too! I went up to a tower and decided to turn back. We then descended to another tower and took lots of pictures. 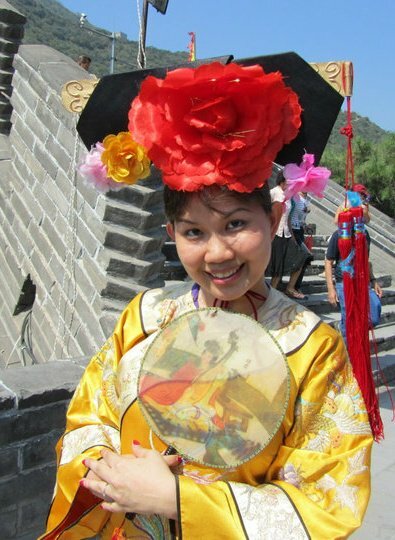 "Concubine on the Great Wall"
14 Sept: Beijing day 3: It’s our last tour day. First we visited the Tiananmen Square which is quite nearby our hotel. The crowd was enormous. We had to literally walk closely so as to not lose each other, however we lost 2 of our mates and they had to go back to the hotel themselves. 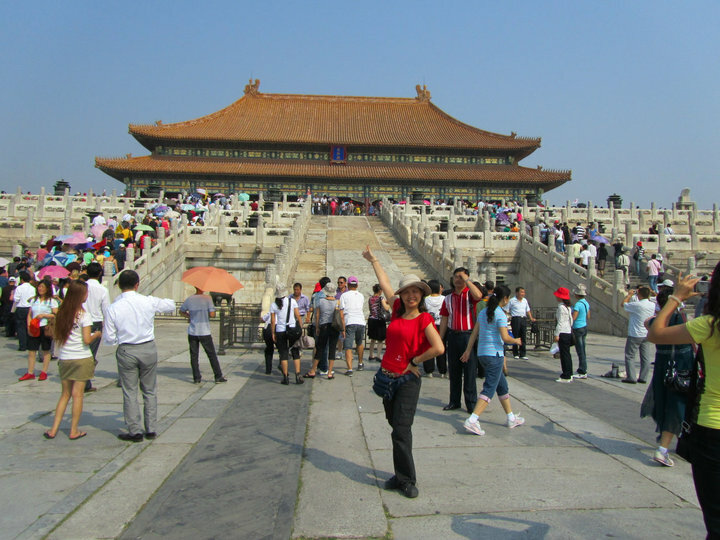 From Tiananmen Square, we walked to the Forbidden City. We would walk into and yet another into entrances. When we reached the main area where (in the movies depicted) the soldiers and officials stand/kneel to the emperor, it was amazing. I could feel the imperial atmosphere of the whole area. We also visited the residence area of the emperor and his concubines, funnily, the lion statues in the residence have their ears drooped (to prevent listening of gossips) while the lions at the court area have their ears standing (being alert). 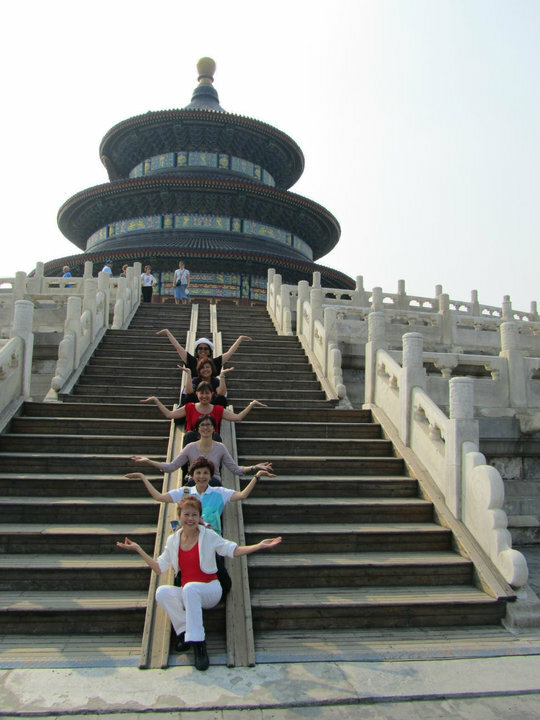 After forbidden city, we visited the Temple of Heaven but did not spend much time there. Again I was disappointed that we were not brought to the Echo Wall. The guide said we did not have much time and that we probably can’t hear the echos anyway due to the noise level during the day! Hmmmph!!! We then left to visit the Pearl Market where Pearls/Jewels/similar things sold in the Silk Market were sold here. Again, everyone tried out their bargaining skills, only better this time! We were supposed to visit the famous Acrobatic Show on the final night and the Wangfujing trip was likely to be scrapped. I had looked forward to Wangfujing to get some supplements for my dad so decided to skip the acrobatic show and rushed to Wangfujing. Had a little bit of wild goose chase there looking for the only store in Beijing who markets the supplements! Found at last and took a motorised rickshaw (tut tut) back to the theater where the acrobatic show was. Managed to watch the 2nd half of the show. Really amazing stunts by the acrobats! The show marked the end of our 1 week tour! The few of us then gathered at the hotel lobby and choreographed a dance to Andy Lau’s Toilet Song which we named The Shanghai Squat. It is written for fun, as many Caucasians in this tour, encountered Squat Toilets for the very first time! 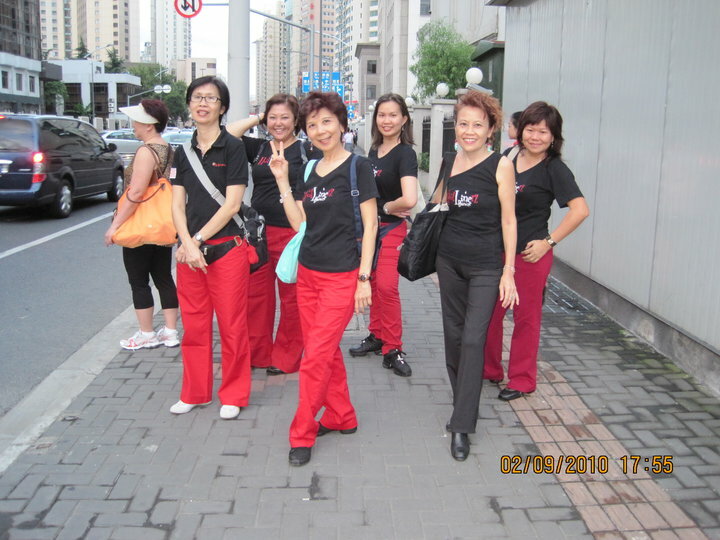 15 Sept: Said our final farewells and took our chartered van to Tianjin. Board our AirAsia flight at 3.50pm and arrived in KL LCCT at 10.15pm. Home Sweet Home, the event and tour remains in our memories, and when I looked back on the photographs, I remembered all the good times and fun we have had!! If I have a chance to visit China (Shanghai or any other places), at least I know where to look for. 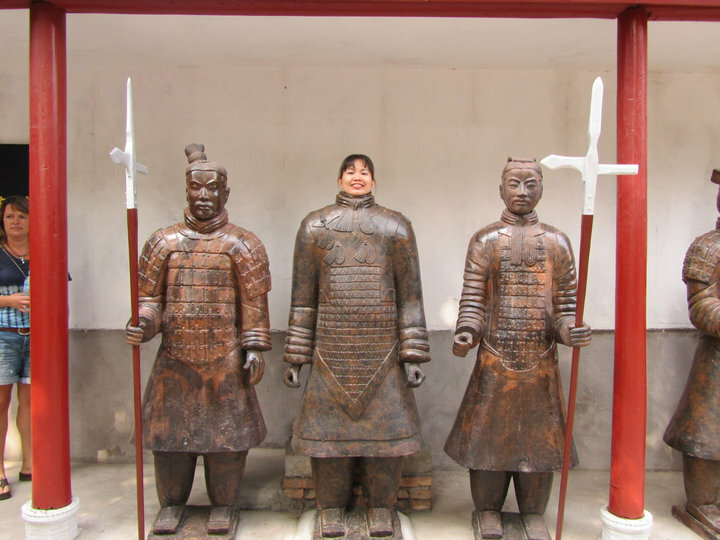 this is just too good and can’t imagine this fantastic tour and trip you had in WOW Shanghai. And one more thing – MALAYSIA CHOREOGRAPHERS MEMANG BOLEH!!!! YES…. Hi Jennifer, you have done great job about our trip and pictures.This is the best I ever seen.Now I know where I have been by dates.You are great a dancer and teacher. I love your side the way you organize.I am going to try one of your dance. ( I am not sure of the name) I will try to get step sheet and music. I am so glad I met you,you are such lovely and friendly person. I really enjoyed reading this – it brought back many great memories! Thanks so much for taking the time to write it. I hope to see you again in San Francisco for WOW 2011! Thanks a lot for your description of our China-tour! It brought back a lot of memories! Now we are back in Sweden and the winter is soon here, the temperature is below 0 deg Celsius during the nights!! It’s hard to understand that only 2 week ago we were wishing some cooler days!! I hope to see you all on the floor some day, you know it’s a small world after all!! pls advise me where i can get them. Tks.